Nicole loves coaching and strives towards helping riders set and achieve their training and competition goals. She is known to be a driven task master and is passionate about correct methodology. Nicole is also passionate about learning and always seeks to expand her knowledge, often travelling interstate and intercountry in an effort to learn more. 1. There is no elevator to expertise. You have to take the steps. 2. Amateurs practise til they get it right. Professionals pracise til they can't get it wrong. 3. Winners never quit; and quitters never win. Nicole is located at 1 Mottee Court, Advancetown on the Gold Coast (10 minutes from Nerang). Lessons at her home are usually 45 minutes duration, and cost $99 including GST. Nicole does travel to select locations at a cost of $104.50 including GST, per 45 minute lesson. 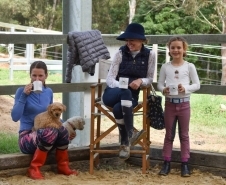 Nicole conducts "Dressage Boot Camps" in the school holidays. These camps give riders between 12-19 years the opportunity to live in and experience a few days of working life at a dressage training barn. Campers bring their own horse and have a lesson every day. They have the opportunity to watch Nicole train and also learn about the routine of daily horse management, mucking boxes, tacking up and down (including bandaging), competition preparation, cleaning gear and property maintenance. A pure working holiday for the dressage enthusiast! Participants bring their own pillow, sleeping bag, clothes, horse, horse feed and equipment. Only 4 spots are available for boot campers and their horses on each camp. Keep an eye on Nicole's Facebook page for Boot Camp dates and details!